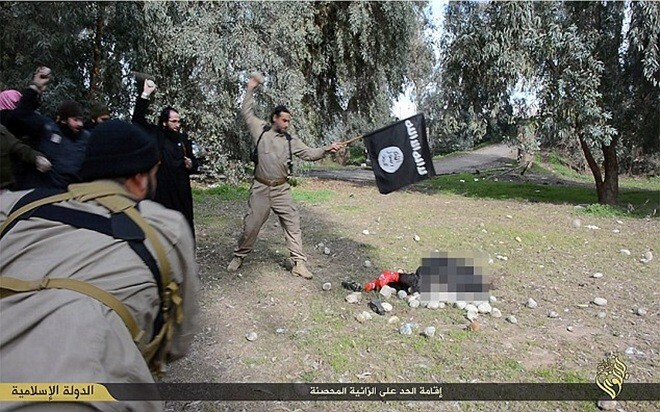 February 1, 2015 ~ Lorra B.
ISIS released photos of an accused adulteress stoned to death in Raqqa. Under Sharia law, adultery is an offense so sinful it is punishable by death. Fornication outside of marriage is taken so seriously that even the family of the accused typically approves of such extreme measures, as the adulterer, whether guilty or falsely accused, has brought shame upon their family and is worthy of honor killing. Because women are considered sinful by nature and are wholly responsible for purposefully or accidentally seducing men into sexual sin, they are most commonly the ones who receive punishment. Since Islamic law requires adulteresses to be stoned to death by their community, a Syrian woman living under the rule of ISIS in Raqqa could not escape her fate after being accused of sleeping with a man to whom she does not belong to in marriage, Daily Mail reports. Insurgents buried the woman up to her torso and “stoned her until they thought she had died,” according to the Syrian Observatory for Human Rights. The woman, however, did not die from the numerous rocks hurled at her head. The militant Muslims ceased pelting her, giving the woman a chance to free herself and flee. “An ISIS militant was about to open fire at her when an Islamist jurist intervened and stopped him saying it was God’s will that she did not die,” the Observatory reported. The ISIS jurist told the woman that she survived only by divine intervention, and that she must “repent” if she wants to live. The woman’s survival is indeed miraculous, as it is nearly unheard of for a person to live through a proper Islamic stoning. Since July, at least 15 people have been stoned to death by Islamists in Syria, 9 of them women. This entry was posted in ISIS, Military, News, Politics and tagged A Miracle Happened, conservative blognetwork, ISIS Stones Woman for Adultery, sharia law, Wordpress.com. Bookmark the permalink. This happens in some “nations of peace” and without Judeo-Christian values. But then it is not adultery if an ISIS male rapes women as they often have. No stoning there! The whole concept of stoning is cruel, barbaric and typical of a cult that has gone totally off the rails of sanity. Though based on a true story, “The Stoning of Soraya M. one video in 2008, the rocks were foam. The woman the actress depicted actually died. Sorry. xoxo J.C.